The Vermont AIA is teaming up with the Vermont chapter of the Construction Specifications Institute to present a one-day symposium on the future of the state’s built environment. “Designed in Vermont: Creating Communities that Flourish in the 21st Century” is a full-day event that will bring together architects, policy makers, engineers, developers, landscape architects, and allied manufacturers to explore how best to develop sustainable communities in our state. The day will begin with a keynote presentation by Michael Tavel, AIA, of Michael Tavel Architects in Denver, Colorado. Tavel is an architect and urban designer specializing in sustainable urban neighborhoods, and his talk, “Sustainable Communities: Paradigms and Paradox,” will be an overview of many of the often competing paradigms of sustainable communities and sustainable land use. Tavel will present national and international examples that frame the issues facing Vermont within the context of current global practice and discourse on sustainable communities and sustainable land use. Making Good Towns in Norway, Switzerland and Vermont. Vermont’s varied terrain is similar to that of Norway and Switzerland. Sloped landscapes; deep, watery cuts in dramatic valleys; and the form of our farmsteads are terrain characteristics that have contributed to the shape of towns and villages in these regions. This session explores how the land has formed the architecture of buildings and public spaces and how we as architects and planners can advance the art of making good towns. The full-day symposium takes place at Shelburne Farms, and has been approved for 5.5 AIA learning units. 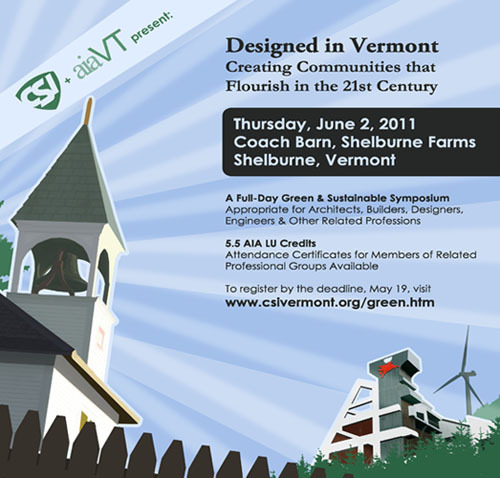 The fee for the event is $125 for members of AIA-Vermont or CSI-Vermont; $175 for non-members. More information is available at www.csivermont.org/green.htm, including a full program brochure. Online registration is open until May 19.